Abstract: Regional Trails data set created by combining 31 different data sets and verified with orthophotography where applicable. Purpose: Regional Trails to be published quarterly for RLIS Lite and provide trail information for various needs. 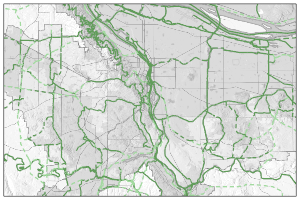 This data set was created specifically for off-road trails and paths, though there are some regional connections that are on-street.